Wahlenbergia stricta, or Australian Bluebell, Tall or Austral Bluebell, is an Australian wildflower from the Campanulaceae family. It is considered the most commonly encountered of the Wahlenbergias] It is found in all Australian states but not the Northern Territory. It is often seen growing by the side of the road, enjoying the extra runoff. W. stricta is a perennial herb flowering mainly in spring or summer with pale blue bell-like flowers. The leaves are long and linear, 5–70 millimetres (0.20–2.76 in) long. The five-petalled flowers are erect on long, slender stems and about 6–20 millimetres (0.24–0.79 in) in diameter. It forms thin, carrot shaped tubers. 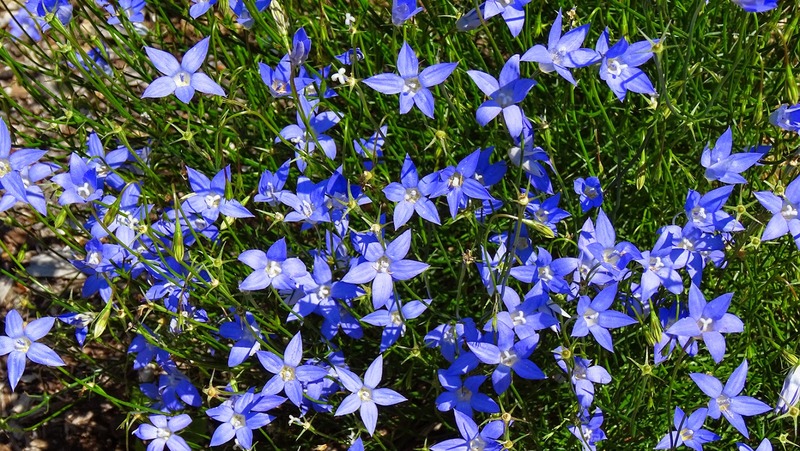 Australian bluebells are generally easily propagated by division or root cutting. The seed is a very fine, black powder. It germinates readily in a few weeks and is best directly sown into tubes or cells as the seed and plant are very small and hard to separate and prick out. There are a number of common cultivars, including various shades of blue from a saturated blue similar to #00f through to white. Various double forms are available. To maintain a cultivar propagation must be by vegetative means (division or cuttings). Once established W. stricta is very hardy - the pot can be dried out completely and the plant reduced to a tuber, yet it will reshoot when the rain comes. It is hardy in a range of soils from sand to gravel, clay to humus. Oh, the blue of it!! This is a must-have, if ever there was one. I so hope this will thrive where the Campanula persicifolia does well, because those pop up all over my sandy soil. Lovely to see, Nick. Thank you. the bluebells are really wonderful. I like the color and your fantastic photo ! What a lovely blue color! delicate blue - I like it! They are the most awesome colour. Love them. The mere fact that it can survive without rain, it sounds like a real wild flower. I would love it in my garden Nick! Thank you for hosting Floral Friday and happy weekend! Thanks for hosting and sharing your Australian Bluebell...lovely flower! Beautiful! Bluebells have always been one of favorites..so cheery and bright! Thank you for this opportunity to link to Floral Friday! A blue carpet of flowers. our blue bell doesn't have stars pointed out.